I did not know what to expect arriving in Washington, I haven’t spent a lot of time travelling in America but what I was excited about was staying at the Four Seasons Hotel. I have been to several Four Seasons hotels in the UK and one thing I have come to expect is luxury and excellent service. I was looking forward to seeing if the same would be true across the pond. After a long journey it was great to finally arrive at the hotel, a beautiful brick building that from the outside seemed to be at the head of an intriguing little town, Georgetown, as well as being a thirty minute walk to all the main attractions. With 222 guest rooms, the hotel was smaller than I imagined yet the perfect size to feel homely and personal. In fact, it felt a bit like walking into your friends home, be that a friend who happens to be a multi-millionaire interior designer. Whilst there I learned that Four Seasons Washington is where the Hollywood and political elite choose to stay. This was evident when film star Bill Murray took our table at the Bourbon bar as we headed off for dinner, writer and comic Larry David was spotted in reception and the American football players, the Dallas Cowboys, were receiving a briefing before their next big match. I am not going to lie, I was rather starstruck seeing Bill Murray and Larry David, they are such legends and very talented indeed. Overall there are 1650 carefully selected pieces of art throughout the building, adding a personal and homely touch. After our bags were kindly taken and sent to our rooms, we were greeted by cheerful reception staff that seemed just as excited as us about our arrival. I told them we were going to a very special wedding that was being held at the hotel that weekend and they presented us with a thoughtful suggested itinerary that our friends had made for us. On entering our room, we were pleasantly surprised with how large it was. We had a lovely view into the courtyard where at night the fire pits were lit up and looked awesome. There was a great big sofa and a desk for writing and I used both over the course of our stay, a real added bonus to have those areas to relax in, especially as we were there for seven nights. On the table were some handcrafted chocolates and a written note, it’s those thoughtful little gestures that for me, really give a personal touch which is much appreciated. 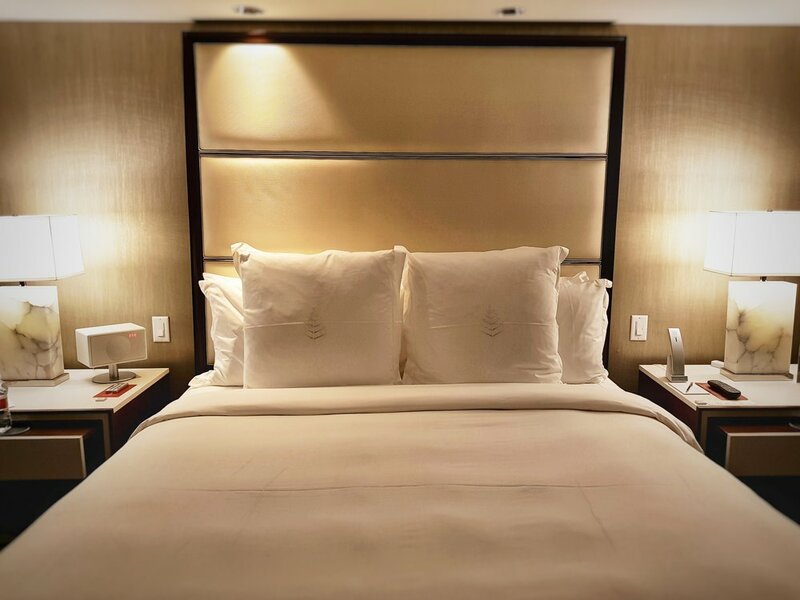 There are three things I usually expect to find in a luxury hotel room; a larger than life King bed, fresh white linen and gorgeous fluffy towels. Fortunately I can confirm that all my great expectations were indeed met on this occasion. The additional perks that I enjoyed were the Salavatore Ferragomo toiletries, Caffee Umbria coffee maker and several USA/UK adaptors, because who remembers to pack more than one, if one at all? It was safe to say that I was very happy in my new accommodation. The next morning I ventured to the gym and swimming pool, the gym was laid out over three floors and had lots of natural light and nice views out onto the quiet neighbourhood streets. The pool is perfect for a few morning laps and the hot tub will definitely warm you up for a cold day ahead. There was a relaxing ambience in the pool and gym areas and afterwards you can get changed in the well-equipped and spacious changing rooms after a sauna and steam. Coming from the small and overcrowded London gyms, the changing room in itself was a very relaxing and worthwhile treat, especially as there were lots of lovely Moroccan oil hair products to test out. There was also a great coffee and juice bar where I made myself delicious iced lattes before heading out to explore the city. One thing I wasn’t expecting from the hotel, was the event space. With a grand ballroom and eight function spaces, these were a lot bigger than I expected and it was fantastic to see some of these rooms in all their glory at our friends fabulous wedding. For further detail on dimensions and seating options on offer, click here. As for food, there is plenty to eat and drink at the Four Seasons Washington. Including the award winning Seasons restaurant for a power breakfast and Eno Wine bar to sample some wine and cheese. Then if you're looking to impress, it's on to Obama’s favourite, Bourbon Steak for an extravagant dinner, restaurant pictured above and below. You are truly spoilt for choice on all counts. Unfortunately I did not dine in the hotel restaurants as we ate out every night but we had pre-drinks in the Bourbon bar and outside on the terrace which had a great atmosphere and looked impressive at night thanks to the fire pits. 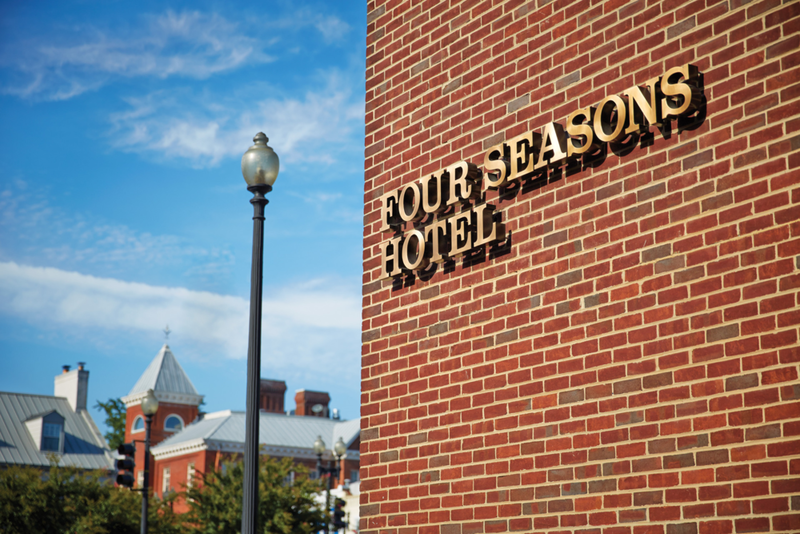 It was an excellent and memorable experience staying at the Four Seasons, Washington, I felt sad to leave as there was still so much to explore and try, both within the stunning hotel itself and in the city of Washington. The only solution to resolve that will be to book another trip!